Local 10 viewer @Danimidah spotted this “commuter” Sunday night on I-95 between Hollywood and Aventura. 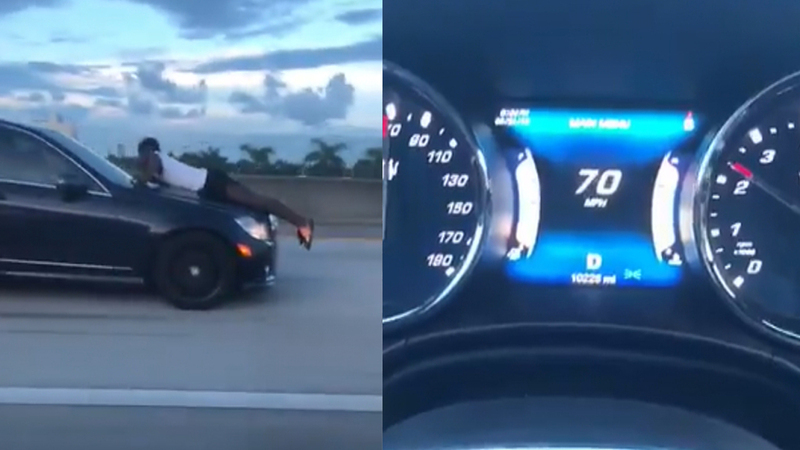 While the man was sprawled out on the hood, the car was hitting speeds of 70 miles per hour. “She is definitely pissed off at him or something,” said Daniel Midah, who recorded the incident. Midah said he was driving south on I-95 about 8 p.m. Sunday when he looked out his window to see the driver and a person on top of her car. “All I was thinking is, this guy is going to slide off and hit me, slide off the other side or, if anything, he is going to slide down and she is going to hit him, and then she is going to crash into somebody else,” Midah said. The car and its extra passenger eventually exited at Ives Dairy Road, at which time Midah called 911. Midah said he believes the man riding on the hood was on the phone with the woman who was driving the car. “He didn’t even look like he was freaked out by what was going on, but I was freaking out,” Midah said.